First, a video of some tricks from our Canadian friends Ed, Emile, and Hugo. They're not only great riders, but great guys as well. You may have seem them in our region before. They were here for NAUCC 2013 when we hosted it in the Harmony/Zelienople/Portersville area. Hopefully these inspire you to get off the couch and get on the wheel (yes, we do some tricks and play basketball). As always, we meet at the Butler YMCA on Saturdays from 4:30-6:30pm until late April. Friday nights (around 7 or so) we ride at The Wheel Mill in Pittsburgh. Occasionally we even break out the hockey sticks there for some crazy uni hockey. If you don't have a unicycle, we have you covered at both venues. 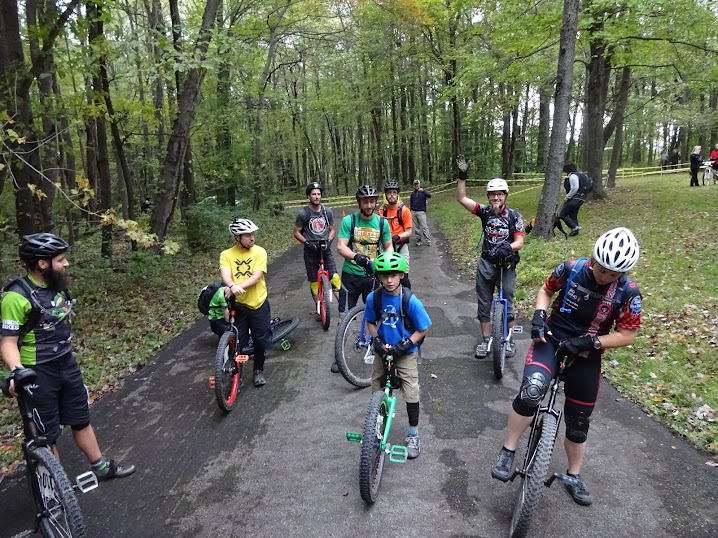 The YMCA keeps all riding free, and The Wheel Mill offers discounted admission for unicyclists on Friday nights. Winter is still here for at least a bit. Might as well pick up a new skill or two.